Have you ever made beer bread? Well, I tried my first loaf yesterday. It was scrumptious! My family loved it. I almost made myself sick eating it. The loaf is almost completely gone now. So what am I doing about it?….why, making another loaf, of course. 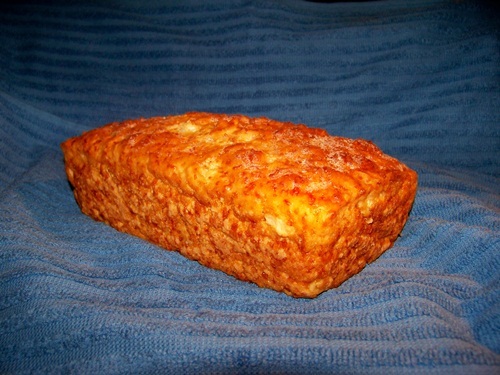 Here is the easy recipe for you and if you would like some other variations, check out allrecipes.com. Mix flour, sugar, onion and cheese together in a bowl with a wooden spoon. Add beer and mix well. Batter will be sticky. Pour into loaf pan. Let sit for about 30 minutes. Bake in oven for 50 to 60 minutes. Cool on wire rack. Slice and eat. YUM! Well I wanted to make a shawl. 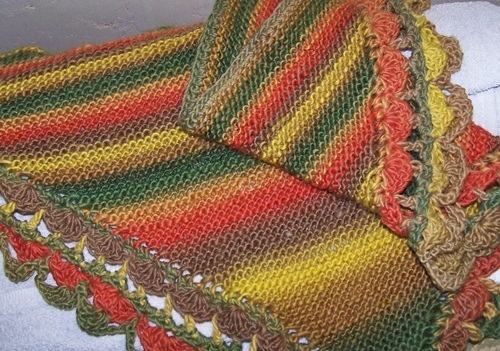 An EASY shawl. 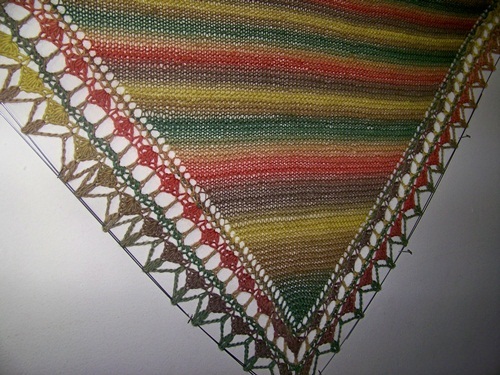 So I searched You Tube (gotta love You Tube) and found how-to’s for a simple triangular shawl. That was easy. I followed the instructions and knitted the triangular part with one ball of yarn. I just kept knitting until I ran out of yarn. Then I decided to add a crocheted edge. Don’t ask me for the pattern, because I made it up as I went along. I used what fit the shawl, improvising and setting my mouth right to get it to work. Looking at it, I thought well it’s large enough for a scarf. So I had to block it to stretch the yarn and make it at least resemble a shawl. That was a little tricky. I used lace blocking wires and stretched that sucker tight. Then I let it sit until it dried. I’m pretty happy with the results. BTW, I used Knit Picks Chroma Worsted in New England colorway. I’ve recently started a few new projects. 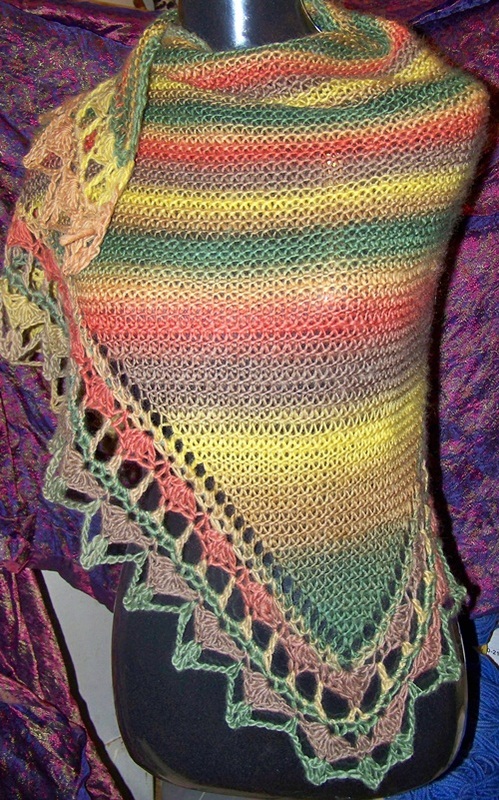 One of which is the Multnomah Shawl. The pattern can be found on Ravelry. And it is a free download. This will be a first for me..a knitted shawl. I’ve crocheted a few, but never knitted one. I think I will be learning a few new things along the way. 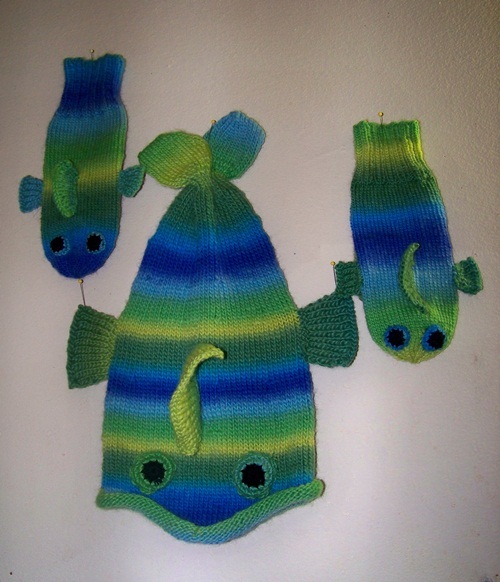 I have been working on Fish Hats and decided to knit matching mittens. 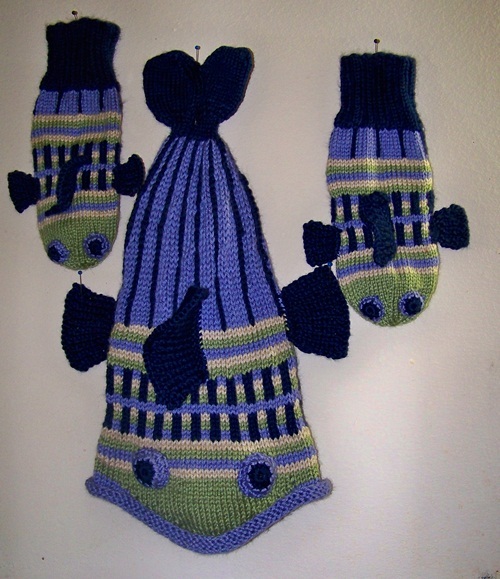 I was unable to find a specific pattern for Fish Mittens, so I did my own. Here are the “how to’s”. Cast on 48 stitches and divide evenly over 4 needles. Join. K2 P2 around until cuff measures 3 inches or desired length. Knit plain (stockinet stitch) until you have reached your first measurement. My wrist to thumb joint measurement is 2 1/2 inches. K2, using waste yarn K 6 stitches. Slip these stitches back to the left hand needle and continue knitting until you reach your second measurement. My second measurement, thumb joint to tip of index finger is 4 inches. (K4, K2 together) around. K 3 rounds even. (K3, K2 together) around. K2 rounds even. (K2, K2 together) around. K1 round even. (K1, K2 together) around. K1 round even. K2 together around. Cut yarn out about 10 inches. Thread yarn needle and pass yarn through all stitches on needles. Remove needles. Pull yarn tight and secure on inside of mitten. Remove waste yarn carefully and place live stitches on 3 needles. You may want to insert the needles before you remove the waste yarn. Pick up an additional 3 stitches on each side. This is to prevent holes and make the thumb large enough. So you will have a total of 18 stitches. Attach yarn and knit around until thumb measures appropriate length. Mine measures 2 inches from joint to tip. (K2, K2 together) around. K 1 round even. K2 together around. Cut yarn out a sufficient length to thread through remaining stitches on needle. Pull tight and secure on inside of thumb. Now for the FISH part…the fins and eyes. Cast on 10 stitches leaving a long tail to sew to mitten. K1 P1 for 5 rows. Repeat for 2nd pectoral fin. Place fins on mitten and sew securely. Using a magic loop to begin your crocheted eyes, make 10 single crochets in the center of the loop, join. Cut yarn. Pull beginning yarn end tight to close up the hole. 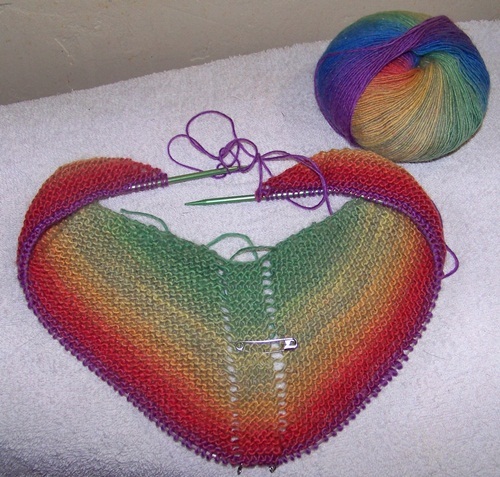 Join contrast color yarn. Chain 1, (single crochet in next stitch, 2 single crochet in next stitch) around. Join and end off, leaving a long tail to sew to mitten. Place eyes on mitten in a pleasing manner and sew to mitten. Stuff loose ends inside as you go. You can also add a little fiber fill if you wish. And there you have it. A basic mitten turned into a fish. 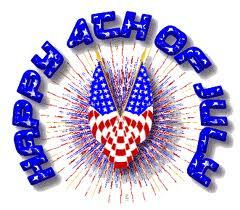 Hope your day is filled with family, friends and fun. Hope you get to see some fireworks too. If you are in an area that has been deemed to dry for fireworks display, bring out your old photos of past 4th of July celebrations and travel down the good times memory road. And, please remember our troops. Say a little prayer for them on this glorious day, for without them, our freedom would not be possible.